What are CoachStation Collaborate & Learn workshops? The CoachStation Collaborate & Learn program provides the opportunity to share with and learn from peers and leaders within your own and other industries and organisations. The ability to broaden each participant’s thinking and seek new alternatives is an excellent platform for personal and professional development. Our program generates new insights and ideas whilst creating a support network to share, collaborate and remain abreast of industry trends and knowledge. CoachStation Collaborate & Learn workshops are an easy way to develop and motivate yourself and/or your employees, while fostering an environment of communication, collaboration and learning. 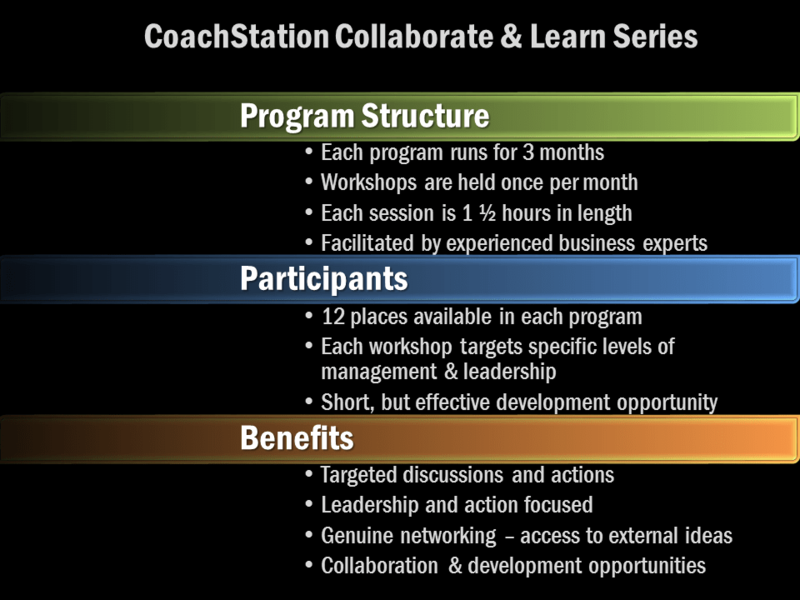 Each CoachStation Collaborate & Learn program runs initially for 3 months, with one session per month. Each session runs for 1.5 hours and a maximum of 12 places are available for each program. This provides the best opportunity for participants to provide input whilst taking on new thinking and learning. The core purpose of the program is sharing, learning and collaboration. As a result, the topics are led by the needs and situations of each group. This personalised and tailored approach allows the best opportunity for group members to connect with each other, the content and their own contribution. We state a limit of participants per organisation (generally 4) as one of the key benefits is the sharing that occurs between industries and cultures. This way we have a minimum of 3 different organisations attending. However, we do work with organisations who want to run their own programs. Contact us to discuss if you have a specific need for your business. Your CoachStation facilitators will guide the sessions to keep them on track and ensure that planned themes/topics are discussed and meaningful outcomes take place. Program participants are targeted at specific management/seniority levels to ensure that discussions and content are relevant. Understanding what is happening outside of your own organisation and culture provides a real prospect for broadening your thinking and mindset. We have seen genuine actions and change occur through this type of exposure and improved understanding of ‘what it could be’. Collaborate & Learn workshops build community – deepening your networks within your own industry and external to your normal circles of contact. A focus on themes identified by the group such as Leadership; Time Management; Managing Conflict in the workplace; existing challenges and successes; and similar concepts ensures relevance. The workshops provide a genuine opportunity to collaborate and develop capability in influencing; listening; questioning; and other core leadership attributes. Assists many to understand that they are not isolated or alone in their thinking and that the situations they are managing do occur elsewhere. Investing in your own development and growth is one of the most important aspects of leadership you can focus on. The workshops are ideal for those of us who are time-poor but have a desire to continue to grow as they are targeted, practical and focused. Generally, we hold the sessions over the lunch period to minimise the impact on your time. The CoachStation Collaborate & Learn workshops provide an additional opportunity to develop your capability, knowledge and skills, supporting the various other personal and professional development options that CoachStation offers. This investment provides you with attendance in 3 Collaborate and Learn sessions and post-session learning and support material. Each place is transferable between employees, however the optimal results are achieved through regular and consistent attendance. Contact us to discuss how we can assist your organisation with a Collaborate & Learn program, or if you are interested in attending a workshop in your area.